It seems the brave new world of the Kickstarter/pre-order beta is here to stay, and with it comes many new and wondrous phenomena such as “paying for something nearly two years ago and then forgetting all about it until an email plops into your inbox telling you the game has been released on Steam.” This has happened to me at least twice in the last year alone, and now we have unexpected surprise #3: Desktop Dungeons, a game which impressed me greatly with its proof-of-concept alpha, opened the gates on pre-orders to great fanfare early in 2012, and then subsequently went almost totally silent until last Thursday when I was informed that I could finally go and get my Steam key from their website. 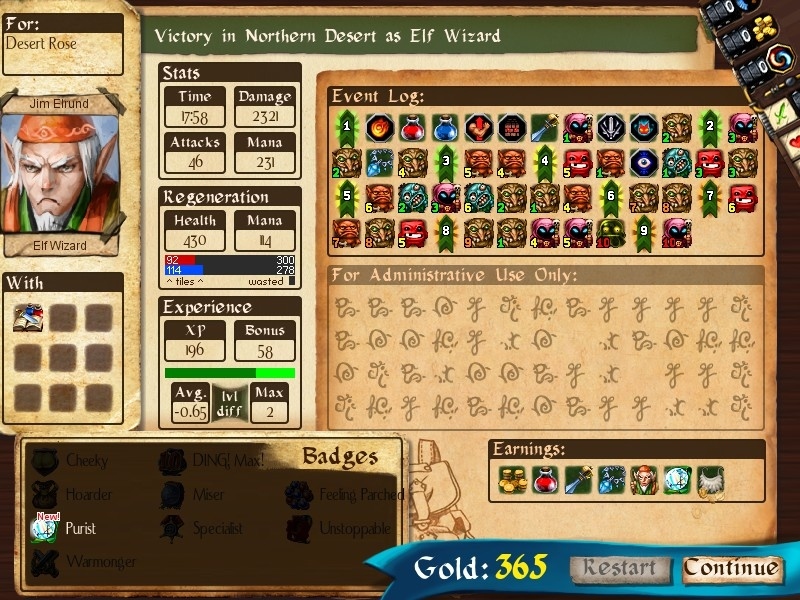 You get more experience for killing monsters which have a higher level than you. A level 2 monster will yield more experience if killed when you’re level 1 than it will if you kill it at level 2 or 3. Higher level monsters are commensurately tougher and more dangerous, but if you have some sort of edge – a sword giving you extra damage, perhaps, or a fireball spell you can use to get some free hits in – this system encourages you to target the bigger enemies in order to maximise your experience income. In fact it’s almost compulsory, since if you only engage enemies that are weaker than you you probably won’t be able to level up enough to take on the dungeon boss. The regeneration mechanic. Health can be regained in several ways, but most of them involve expending your very limited resources that you’re trying to hoard carefully in preparation for your showdown with the dungeon boss. The primary way you get your health (and mana) back is to explore the dungeon and push back the fog of war; for every tile you uncover you get a small refill of your health and mana bars. But there’s only so many tiles in the dungeon, and thus a finite quantity of health you can regenerate in this way. If you burn through it all without managing to kill the end boss, it’s game over for you. The interaction of these three mechanics is what makes Desktop Dungeons so utterly compelling. You have to target higher-level monsters, but you’ll probably lose a lot of health doing so. You can get it back by exploring, but there’s only so much health regen in the dungeon. And if you can’t find an appropriate monster to attack you’ll be forced into exploring with a full health bar, with every step you take wasting that precious regen and diminishing your chances of successfully finishing the run. Desktop Dungeons is, at its core, all about utilising these limited resources – whether they’re in the form of the gold you pick up, or the potions you can drink, or the tiles you uncover — efficiently enough that you don’t run out of juice halfway through the dungeon and get forced into ignominous retreat. This is the beating puzzler heart of the game, and it’s given a TF2-style ubercharge by the added roguelike elements. You can take on a dungeon with any one of 15-odd classes and eight races, each with their own special abilities and innate talents. You can spend your hoarded gold on preparations for the dungeon, perhaps choosing to take in a sword with you or guarantee the spawning of a particular god’s altar to give yourself a leg up on those critical first few levels. 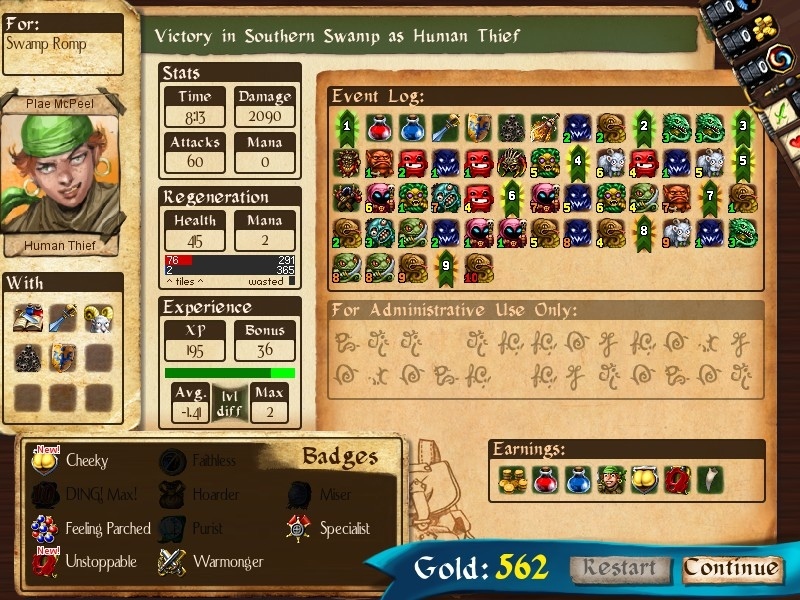 And once you’re in your choice of which monsters you want to try and kill will be dramatically affected by the items you manage to pick up along the way and the vast, vast number of monster types in the game. Some of them are resistant to physical attacks. Some of them stop health or mana regeneration from tiles if they hit you, forcing you to either level up or drink a potion in order to clear the debuff. Some of them have deadly first strike capability that can take you out before you even land a hit; some have magical attacks that bypass your physical resistance; and some will even curse you so that you take full damage from all attacks until you kill some more monsters to cure yourself. Your hero class will likely be strong against some and weak against others, and so you have to figure out how best to play to your strengths by taking out the weak ones while you’re weak and the stronger ones while you’re strong. 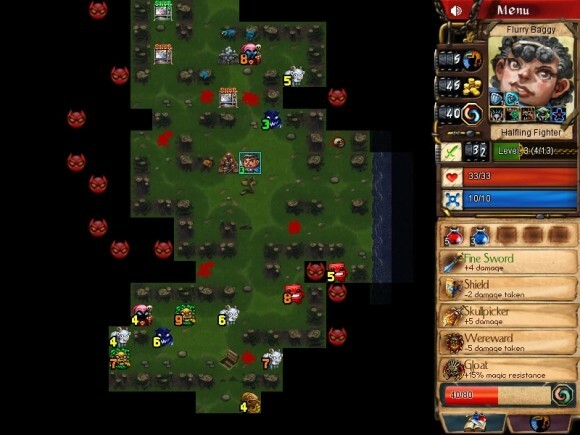 Glyphs, gods and conversion are the final ingredients of Desktop Dungeons’ actual dungeons. Glyphs give you spells or special abilities that you can use in exchange for mana; the fireball glyph is by far the most common (and useful) but there are about a dozen others, including glyphs which heal, glyphs which protect you from what would otherwise be a fatal blow, and glyphs which allow you to tunnel through dungeon walls or even knock enemies through them. You can only carry six glyphs or other items, but that’s okay because any unwanted items can be converted into the disappointingly-named “conversion points”. Once you amass enough conversion points you get a permanent race-specific bonus – so humans get a damage bonus, dwarves get a health bonus, elves get a mana bonus etc. It’s common before engaging the final boss to burn every single item you don’t need on the altar of conversion to give yourself as much of a boost as possible; believe me, you’ll need it all. Finally there’s the gods, who can be worshipped at altars to try to gain piety that you can exchange for immense boons. Each god gives you piety for different things and places certain restrictions on your play; for example, Taurog likes it when you murder things in close-combat and doles out a nifty set of armour in exchange for your slaughtering your way through the dungeon’s residents, but he’ll turn on you if you try and use magic. At first you’ll just lose piety, but if you run out you’ll get some horribly crippling penalty like all monsters in the dungeon suddenly gaining 25% magic resistance, which can completely screw a dungeon run. So the gods are all about that risk/reward relationship that exemplifies all of Desktop Dungeons’ core gameplay. It’s also admirably transparent, with indicators and markers telling the player exactly what will happen when they hit that monster — if they’ll kill it outright, if the return blow will kill them, and how much health they’re likely to lose in the process of whittling it down to zero HP. It’s a fantastically designed little game that you can see for yourself if you go and download the free alpha, and if it had kept things focused to just that core dungeon running experience I would likely have nothing but positive things to say about Desktop Dungeons. 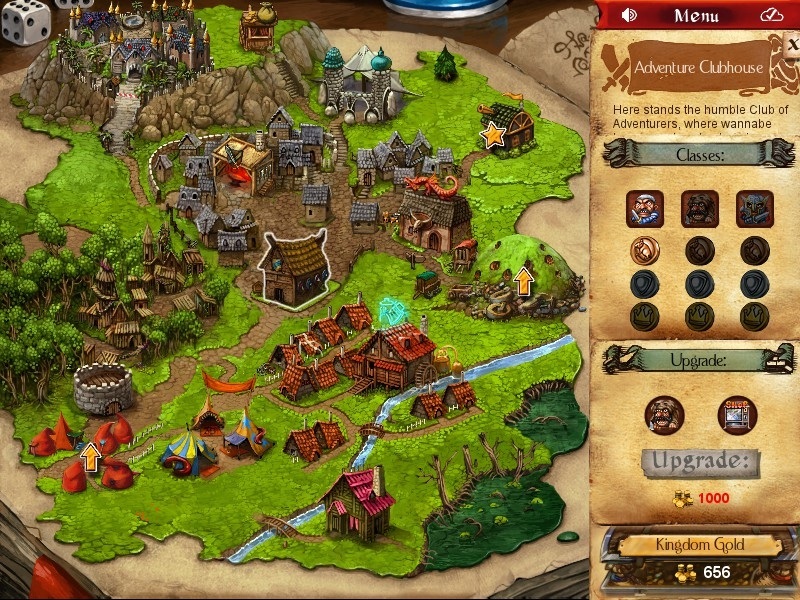 This being a paid-for product, though, the developers have felt the need to go above and beyond that, adding a significant metagame layer where you use the gold you get from dungeon runs to upgrade your kingdom and unlock more items and hero types – and while this metagame layer isn’t bad, exactly, it’s significantly more of a mixed bag. For starters I think they’ve gone too far with the unlocks. When you start Desktop Dungeons for the first time you only have access to basic human Fighters who start dungeon runs naked – there’s no preparation available, no gods or items or alternate classes or anything, because you haven’t unlocked them yet. Not only does this massively limit your options at the start of the game, but it gives it an inverse difficulty curve similar to that of the XCOM remake: the game is hard as nails at the start when you have nothing to work with, and then actually gets significantly easier later on once you’ve gained the ability to stack the deck in your favour. The Fighter’s actually one of the more difficult classes to succeed with, too, and while they may have been the simplest choice in terms of gameplay it’s probably going to lead a lot of people into thinking Desktop Dungeons is a lot tougher than it actually is. And when that baseline level of toughness is already set at “very difficult”, making the start of the game even more difficult is just going to give people the wrong impression. It wouldn’t be so bad if the game was a bit clearer on how you go about unlocking stuff, but as it is the races and gods are all locked away in randomly-generated subdungeons that you have to clear a challenge in – and if you don’t have the right class or items to pass that challenge you can forget about it. As with all roguelikes Desktop Dungeons’ greatest asset is its variety, and while it’s necessary to gradually introduce different monster types and classes so that you don’t get overwhelmed the way DD does it at the moment is far, far too cautious and unnecessarily straitjackets the player, which makes the first hour or two of the game far more painful than they should have been given the elegance of the underlying design. The production values of the metagame are also… well, we’ll just say they’re not the best and leave it at that. Sure, the dungeon graphics are basic but there’s actually a lot of thought that’s gone into the visual design, with the crowning glory being the fantastic hero portraits that headline your character information at the right hand side of the screen; there’s male and female portraits for every single class/race combination, with my favourites being the human female berserker and the supremely pissed-off male elf wizard.. The soundtrack is also outstanding – which is as it should be, seeing as it’s been co-written by the guy who did Banjo-Kazooie’s music. This attention to detail is entirely missing on the kingdom layer, however; it has a layout that’s confusing at times and is practically indistinguishable from a thousand throwaway flash games. I don’t know what happened here but it seems like the developers dropped the ball, especially since the kingdom layer still very much resembles what I played in the beta version nearly two years ago. Fortunately it’s not a total failure; the kingdom layer has challenges, quests and puzzles galore to keep you occupied and encourage you to try playing with a class or race that you would otherwise avoid, and these provide a strong underlying structure that props up the depressingly weak overworld. While I wouldn’t call the first hour bad it’s certainly not all the game can be, but once you’re over that hump you can start really getting your teeth into that dungeon running – and this is just as compelling and addictive as it ever was. More so, even. It’s a shame the kingdom couldn’t quite live up to the same standard, but while it does diminish the final product somewhat it hardly undoes the fact that Desktop Dungeons is probably going to show up somewhere in my Best Of The Year list in about a month’s time. The game really is quite astonishingly good in spite of its failings, and while I hardly think it vindicates the idea of the preorder beta I at least feel a lot better about investing my money in this particular instance. All things considered, it really couldn’t have worked out any better than this. This is sitting on my laptop waiting for me to have a little free time, but it also has to compete with XCOM Enemy Within and my ongoing Pokemon X addiction. It’s been a great Fall for games. Enemy Within just devoured a terrifying quantity of my weekend, and there’s Black Flag on the horizon next week. Such is the October/November madness that afflicts the gaming industry. If I ever get a PS4 or a better PC I’ll get Black Flag. I’d pick up the PS3 version, but after the performance of the earlier PS3 games I don’t know that I can grit my teeth and bear it. But God, Enemy Within is fantastic. I don’t know if it’ll do much for the replayability issues we’ve discussed here before, but it really pumped a lot of life into the game. Hope you do a writeup. I loved the free alpha demo thinger from 2 years ago. I will pick this up at some point I suspect. If it ever gets cut to half price it’s a must-buy. Some people might think £12 is a lot for a fifteen-minute puzzler like DD, but for £6 it’d be a bargain. When I read these thoughts I had to browse through my iPhone games. 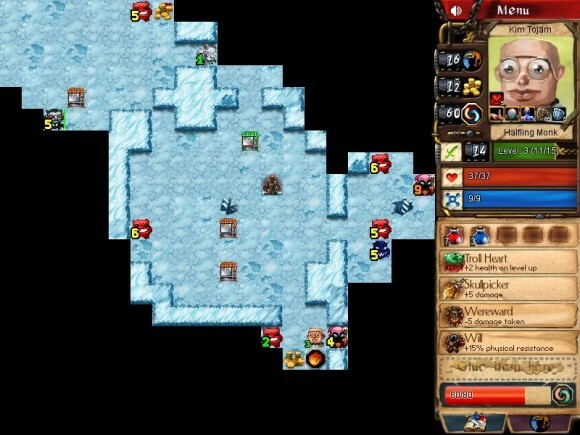 I was sure there was something similar to Desktop Dungeons for iPhone and – for once – my memory served me right. It’s called “League of Epic Heroes” by Lazy Peon, but unfortunately I couldn’t find it in the app store anymore. It doesn’t have the Kingdom part and dungeons are smaller, but there are 6 unlockable races you can combine with 12 unlockable classes and the dungeon crawling/puzzle mechanic seems to be pretty much identical to Desktop Dungeons. Turns out it was forcibly taken down for being suspiciously identical to Desktop Dungeons. Actually Hentzau I’d be interested in your take on plagiarism in the mobile gaming market at some point, assuming it doesn’t cause any conflicts of interest or anything. Seems a bit of a scourge at present. Here is a short version of my take: if there is *any* reasonably simple game concept which is even remotely popular, even if it’s a freeware web browser game like Cookie Clicker (in fact especially if it’s that, since they’re less likely to have legal firepower), somebody will make a clone of it for mobile in an attempt to make a few low-effort dollars. But yes, League of Epic Heroes was unusual in that the guy who made it sent a letter to the developers of DD saying “Look what I’ve done!” and they sent a letter back saying “Uh, what the hell dude,” before getting Apple to take it down from the app store. It was a blatant ripoff, but usually they’re not that polite.